Goose Bay, affectionately known as "The Goose", is located in Canada's far north. Labrador is the largest geographical portion of the province of Newfoundland, covering 294,330 square kilometers with a population of just over 30,000. At one time, it was home to SAC's 95th Strategic Wing. Air Force Combat Wing Histories (official USAF history) states that the 95th Bomb Wing Medium was established June 4, 1952 and activated on June 16. It was redesignated 95th Bomb Wing Heavy on Nov. 8, 1952. Apparently it was originally slated for B-47s, but was instead assigned B-36s, which it flew from 1953 to 1959. It flew B-52s from 1959 to 1966. It was discontinued and inactived on June 25, 1966. All of this took place at Biggs AFB, Texas. It was reactivated as the 95th Strategic Wing on August. 8, 1966 at Goose Bay. At that time, the wing was flying KC-135 tankers. It was inactivated on September 30, 1976. This conflicts with several web sites that report that was home of the 95th Strategic Wing from the early 1950s to 1976. That is wrong. The decision to build the base was made early in World War II. Toward helping our British friends defends themselves the threat of Nazi German, the United States and Great Britain entered into a "Lend-Lease" agreement. The U.S. gave Britain fifty Word War I destroyers in exchange for eight strategic military locations in the Atlantic and Caribbean. 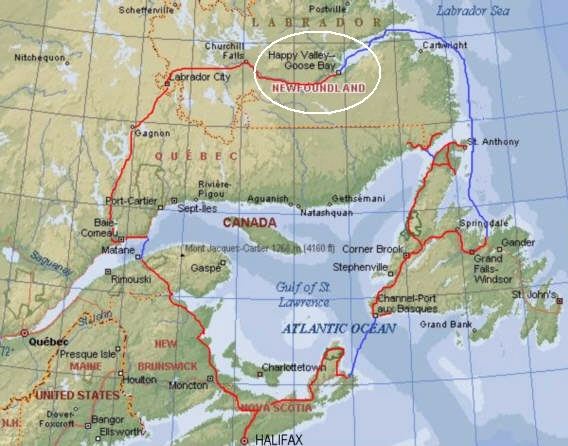 One of these locations became Goose Air Base in Labrador. The Melville Radar Station. was finished in November 1954. The unit which was perched atop a prominent hill six miles northwest of the airfield, was a totally self contained facility with fire/rescue, messes, quarters and even a bowling alley. The USAF's 641st AC&W Squadron, part of Pepperrell AFB, St. John's, Newfoundland based 64th Air Division (Defense), took up residence the same month. NEAC was deactivated 1 April 1957 and replaced by the 64th Air Division; however, all NEAC assets were split up between Strategic Air Command and Air Defense Command. The base was also used by the Royal Air Force (R.A.F.) and the Royal Canadian Air Force (R.C.A.F.). The radar station at Goose Bay was an integral part of the North American Air Defense Command. RCAF Station Goose Bay gave way to unification in 1967 and became a Canadian Forces Base. CFB Goose Bay was soon relegated to station status. On 1 September 1970, a group of 30 Canadian Forces personnel were posted to Goose Bay, where they ran the Manual NORAD Control Centre (MNCC). The USAF Commander of the 641st AC&W Squadron handed the MNCC over to the commanding officer of CFS Goose Bay in July 1971. It became site C-24, and integrated into Canadian Forces Air Defence Command. Melville Long Range Radar was now a lodger unit of CFS Goose Bay. After all the years as a manually operated site, Melville Radar, as it was better known by, was finally SAGE-capable in 1976. This automation considerably reduced the number of personnel assigned to the site. In August 1984, Melville Radar was brought into the Canada East ROCC. In 1985 the radar station acted as a tactical control agency in a series of low level flying proof of concept flights with NATO allies. In February 1988, the closure of Melville Radar was announced. The reason given was that the station was redundant with the North Warning System site, located at Cartwright, coming on line. The radar site ceased operations in July 1988. During SAC's tenure, over 12,000 American military personnel and family members lived on the base. The far northern location resulted in long, very-cold winters. It was not the most desirable duty. Some say it was the origin of the expression, "Up Goose Creek without a paddle." The two settlements of Happy Valley and Goose Bay were amalgamated into a single town in 1974 and together the residents in this wage-based economy have faced hard times as the management of the base changed hands. The town has grown to be the largest centre in Labrador with over 8,600 resident. The majority of retail and service businesses in this area support the operation of the Air Base. Today the base house Canadian forces, but also four others, earning it the distinction of the 5 Wing Goose Bay. There are wings from Britain's Royal Air Force, the German Luftwaffe, the Royal Netherlands Air Force and the Italian Aeronautic Militare. Who in 1940 would have ever thought the RAF and Luftwaffe would someday share an air base? There are also civilian airlines. Even though the economy is based on earning, many residents with Innu, Inuit, Metis and settler heritage still live the traditional Labrador lifestyle using their knowledge of living "off the land." Many families depend on the caribou hunt, fishing and trapping of small game to supplement their diets. A small manufacturing sector is developing in Central Labrador, along with a few small agricultural initiatives in the past 10 years. 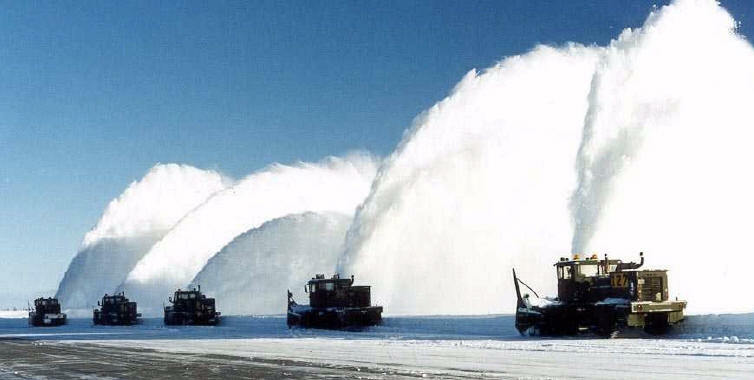 Goose Bay has one of the world's longest runways (11,046 feet.) It is long enough to accommodate the space shuttle and is a NASA designated emergency landing site for space shuttle flights. In fact, the Boeing 747 carrying the space shuttle landed for refueling in 1983. That was the first time a space shuttle touched down anywhere except only US soil. 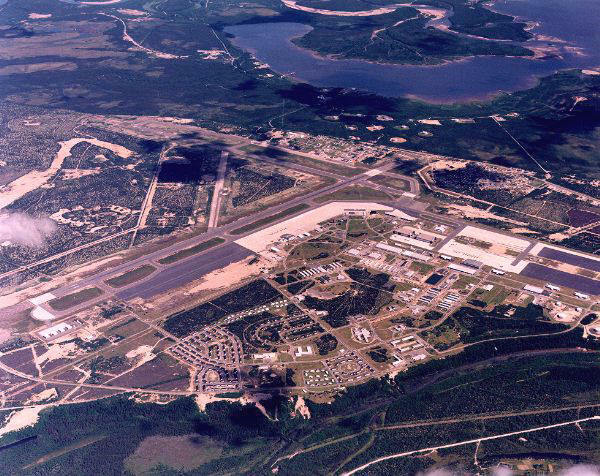 Following the terrorists attacks of September 11, 2001, the Goose Bay Base was filled with commercial airliners that had been diverted from their planned destinations.